Ohh, wonderful wonderful silly movie. Mimi (Rogers) gets the end of her dress stuck in her aunt's trunk as her aunt locks it. 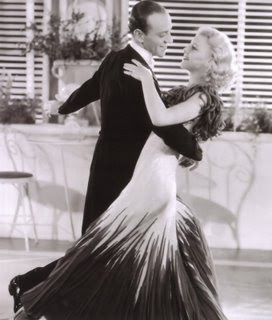 Guy (Astaire) comes by and saves her by quite shockingly ripping her dress. He is smitten. She runs away. He spends weeks in London standing on the sidewalks and starting at every woman's face to find her until he finally rear-ends her car by accident. Every silly dance movie needs a high speed car chase. Lucky thing that Guy thought to buy a "Road Closed" sign at a sporting goods store. What a good way to bring a high speed car chase with one's beloved to a halt. After losing Mimi again, Guy happens to find her at an ocean resort. She is there to try to secure a divorce from the geologist husband she hasn't seen for years. He is there with his lawyer friend who is helping Mimi to secure the divorce. But of course Guy does not know Mimi is the woman his friend is helping. Guy is charming and sweeps Mimi off her feet. The plan that Mimi's lawyer has concocted to secure her divorce involves her spending the night with a hired male "correspondent" and then getting caught by some detectives. Guy unknowingly says the code phrase to Mimi that the correspondent is supposed to use to find her, and Mimi is furious that Guy is not really interested in her but is there for a job. One of many many similar jobs. They even twirl up onto chairs and over tables. 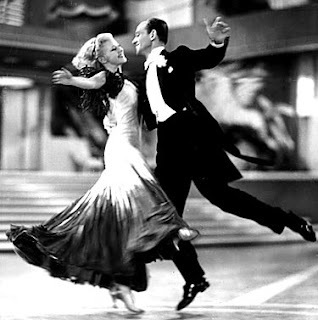 Dancing solves all problems, of course! I hope I get to see this again. 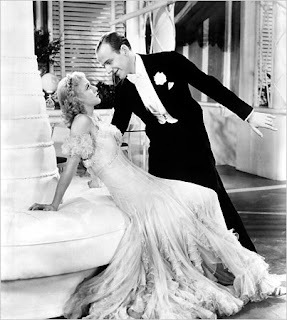 It's now my favorite Ginger Rogers & Fred Astaire movie. Four stars!